For years my mother had been complaining about the unpredictable cooking temperature of the old black stove in the scullery, presenting the Sunday teatime fruit cake with the top cut off due to the fact that the uneven heat had caught the top and blackened the fruit. 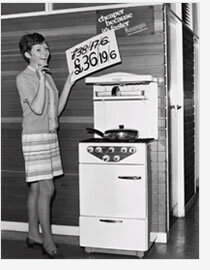 As a further sign of improving times, Mum was to have a new Flavel cooker. There was no more complaining and fruit cakes, and sponge cakes appeared at the table with a flourish – complete with tops. We were saddened when the King died in 1952. He had endeared himself to the nation and our hearts had been touched at the sight of his drawn face as he waved Princess Elizabeth and Prince Philip away for their tour of Africa, not only a King but also a father saying goodbye to his daughter for what would be the last time. The annual (as it was then) Farnborough Air Show had become an attraction not only for those engaged in the aircraft industry, but for many young people who had grown up in wartime especially those in places such as the south coast where the wartime planes were a common sight The interest in the development of aircraft had continued and many young people took their place on the hill at Farnborough to watch and marvel at the displays. Farnborough became an enjoyable event for me and my boyfriend, having served his National Service in the RAF. We travelled to the show by Southdown coach, which was the coach service in the Brighton area. The British Technicolor film ‘Genevieve’ was very popular especially as it had a local background. We laughed at ‘The Goons’ and there were many imitators of Neddy Seagoon and Bluebottle. ‘Take It From Here’ was also lifting our spirits with Ron and Eth the favourite characters. Jack Jackson was an early DJ who played all the hit records on his very popular late night radio programme ‘Record Roundup’. He always signed off with ‘Thank you for having me at your place’.